On April 4, 2017, National Assembly representatives from the Fidesz–Christian Democratic People’s Party (KDNP) governing coalition adopted amendments to the 2011 Law on National Higher Education that were officially intended to regulate the activities of all foreign universities operating in Hungary (source in Hungarian). However, critics claim that the illiberal government of Prime Minister Viktor Orbán designed the amendments specifically in order to force the closure of the Central European University (CEU) in Budapest as part of its broad campaign to suppress liberal institutions, non-governmental organizations and policies associated with Hungarian-American investor and philanthropist George/György Soros. Main building of the Central European University. The CEU is a private, English-language university offering post-graduate degree programs accredited both in the United States and Hungary. During the 2016–2017 academic year, the university had 423 faculty members from 44 countries and 1,448 students from 117 countries (source A and B in English). George Soros founded the Central European University in 1991 with the purpose of “train[ing] future generations of scholars, professionals, politicians, and civil society leaders to contribute to building open and democratic societies that respect human rights and adhere to the rule of law” (source in English). Soros provided the university with an endowment of 250 million dollars in 2001, announcing that “this replaces my annual contribution” estimated at 20 million dollars a year (source in English). 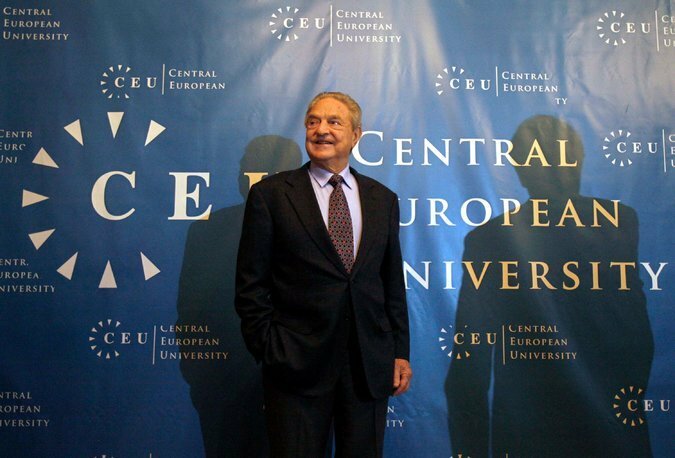 Soros serves as the honorary chairman of the CEU board of trustees. 1. The name of the foreign institution of higher education must differ unambiguously from that of other institutions of higher education. 2. The foreign institution of higher education must conduct higher education in the country in which it is based. 3. Officials from the government of Hungary and the state in which the foreign institution of higher education is based must sign an international agreement “concerning theoretical support for its operation in Hungary” if the institution is based outside the European Economic Area (the European Union plus Iceland, Norway and Liechtenstein). 4. Staff members teaching at the foreign institution of higher education who are not citizens of European Economic Area member states must obtain a work permit. The amendments stated that foreign institutions of higher education that did not meet these stipulations by January 1, 2018 would be prohibited from accepting new students after that date (source in Hungarian). The stipulation of the amendments requiring foreign institutions of higher education operating in Hungary to conduct higher education in the countries in which they are based was relevant only for the Central European University, which does not maintain a campus in the United States (source in Hungarian). The stipulation requiring members of the faculty at foreign institutions of higher education who are not citizens of European Economic Area member states to obtain work permits was relevant primarily for CEU, which maintains by far the highest number of such faculty members among these institutions. On March 28, 2017, Human Resources Minister Zoltán Balog submitted the bill containing the amendments to the 2011 Law on National Higher Education to the National Assembly (source in Hungarian). 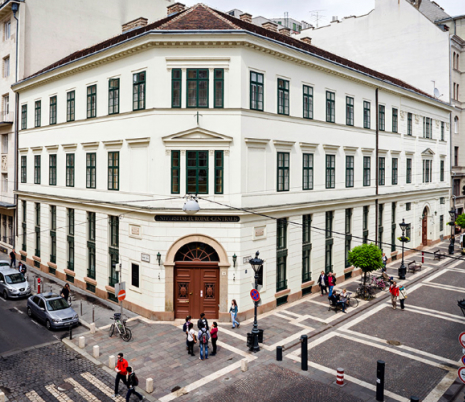 Later on March 28, the Central European University issued a press release stating that “After careful legal study, CEU has concluded that these amendments would make it impossible for the University to continue its operations as an institution of higher education in Budapest, CEU’s home for 25 years” (source in English). On March 29, Human Resources Ministry Higher Education State Secretary László Palkovics held a press conference regarding the amendments in which he stated that they were intended to regulate the operations of all foreign universities operating in Hungary and denied that they were aimed specifically at the CEU. However, Palkovics could name no other foreign universities in Hungary besides CEU that did not already comply with the stipulation of the amendment requiring them to conduct higher education in the country in which they are based (source in Hungarian). On March 29, Central European University Rector Michael Ignatieff met with State Secretary Palkovics to discuss the amendments. Following the meeting, Ignatieff said “We are willing to remain in dialogue with the government but cannot accept the tabled legislation as a basis for discussion” (source in English). On March 30, Orbán government International Spokesman Zoltán Kovács, who earned a Ph.D. in history from Central European University in 2002, denied that the amendments were designed to drive the CEU out of Hungary, claiming that such charges were part of an attempt to “arouse hysteria” (source in Hungarian). On April 4, the National Assembly approved the amendments to the Law on National Higher Education by a vote of 123 in favor to 38 against in an expedited procedure after a single morning of parliamentary debate on the issue. All representatives from the Fidesz-KDNP governing coalition voted in favor of the amendments, while all opposition representatives either voted against the amendments or did not participate in the vote (source in Hungarian). On April 10, President János Áder signed the amendments into law. Demonstrators outside main building of Central European University (photo: Orange Files). 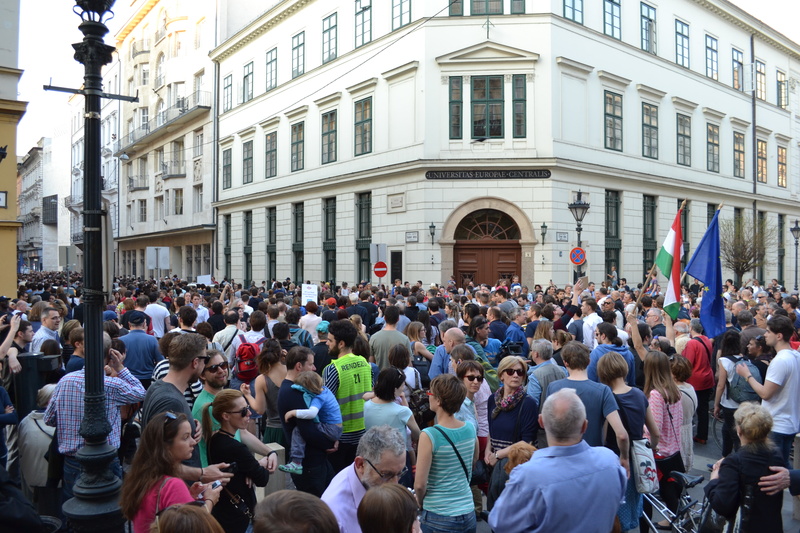 Many thousands of people demonstrated in Budapest against the Lex CEU at demonstrations on April 2 and April 4, 2017, while many tens of thousands people demonstrated in the city against the amendments on April 9 and April 12 (sources A, B, C and D in Hungarian). The Budapest police permitted all four of these peaceful demonstrations take place freely. They were the largest anti-government demonstrations in Hungary since those held to protest the proposed internet tax in October 2014. See gallery of photographs that Orange Files took at the demonstrations protesting the Lex CEU. On April 21, 2017, the green-liberal Politics Can Be Different (LMP) National Assembly opposition party submitted a challenge to the Lex CEU to the Constitutional Court after collecting the required 50 signatures from parliamentary representatives (source in Hungarian). The Constitutional Court is expected to make a decision regarding the LMP challenge to the amendments during the autumn of 2017 (source in Hungarian). On April 26, 2017, the European Commission (EC) initiated the first step of the three-step European Union infringement procedure against Hungary with regard to the amendments to the Law on National Higher Education, which the EC determined violated EU law guaranteeing the following fundamental rights and freedoms: “internal market freedoms, notably the freedom to provide services and the freedom of establishment . . . the right of academic freedom, the right to education and the freedom to conduct a business . . .” (source in English). This so-called Letter of Formal Notice provided the Orbán government with one month to respond to the European Commission’s objections to the amendments. On May 25, Minister in Charge of the Prime Ministry János Lázár announced that the government would not change the amendments to the Law on National Higher Education despite the European Commission’s Letter of Formal Notice, declaring that “György Soros has lobbied well in Brussels” (source in Hungarian). On July 13, 2017, the European Commission initiated the second step in European Union infringement procedure against Hungary with regard to the amendments to the Law on National Higher Education. This so-called Reasoned Opinion provided the Orbán government with one month “to notify the Commission of measures taken to remedy the situation” (source in English). Overall, the new regulatory framework introduced by the Law may legitimately be applied to foreign universities which are not yet active in the Hungary. The requirements to be fulfilled by those foreign universities seeking to provide education in Hungary are in line with existing practices in other European countries and do not appear to contradict applicable norms. They may be regarded as serving the purpose of ensuring increased clarity and transparency as well as the quality of higher education, in line with the applicable Council of Europe standards. This being said, introducing more stringent rules without very strong reasons, coupled with strict deadlines and severe legal consequences, to foreign universities which are already established in Hungary and have been lawfully operating there for many years, appears highly problematic from the standpoint of rule of law and fundamental rights principles and guarantees. These universities and their students are protected by domestic and international rules on academic freedom, the freedom of expression and assembly and the right to and freedom of education. The Council of Europe is a 47-member international organizations that aims to uphold human rights, democracy and the rule of law in Europe and to promote European culture. It is not the same as the European Union, though all members of the EU are also members of the Council of Europe. The Venice Commission of the Council of Europe is an advisory body composed of independent experts in constitutional law. The issue of the universities is an important and sensitive theme even if hardly more than 10 percent of the students who study at the Soros institution are Hungarian. With time it will become obvious that the fears are groundless. Slowly everyone will realize that this is not a question of university closure, but of [ensuring that] the laws apply equally to every Hungarian university. News has spread that the Hungarian government has closed via law the private university of American financial speculator György Soros operating in Budapest. . . . This accusation is groundless. The situation is absurd. Just as if they accused and convicted somebody of murder while the victim of the alleged crime is living and thriving. And what’s more, he himself is pointing to the convicted and screaming murder. The truth is that the small-scale amendment adopted by the Hungarian National Assembly affects 28 foreign universities operating in Hungary and does nothing else than to standardize the regulations pertaining to them, to close the opportunity for abuse, to demand transparency and to eliminate the privileged situation enjoyed up until now vis-à-vis European universities. You are European legislators. It is my obligation as the prime minister of Hungary and the leader of an EU member state to ensure that European and Hungarian universities are not in a disadvantageous position vis-à-vis their non-EU competitors. No matter how big and wealthy their owner is. The United States is concerned about legislation proposed by the Government of Hungary on March 28th that imposes new, targeted, and onerous regulatory requirements on foreign universities. If adopted, these changes would negatively affect or even lead to the closure of Central European University (CEU) in Budapest. 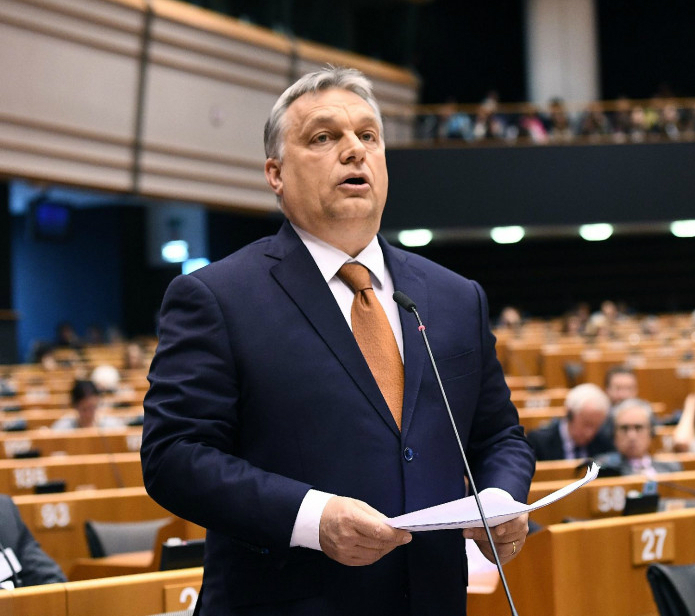 . . .We urge the Government of Hungary to avoid taking any legislative action that would compromise CEU’s operations or independence. We are very concerned about this legislation that was passed by Hungary’s parliament last week that was signed into law by the president this week . . . And we believe it threatens the continued operations of Central European University, which is a leading academic institution. . . . So we’re urging the Government of Hungary to suspend implementation of the law. The United States again urges the Government of Hungary to suspend implementation of its amended higher education law, which places discriminatory, onerous requirements on U.S.-accredited institutions in Hungary and threatens academic freedom and independence. The Government of Hungary should engage directly with affected institutions to find a resolution that allows them to continue to function freely and provide greater educational opportunity for the citizens of Hungary and the region. The U.S. Government has no authority or intention to enter into negotiations on the operation of Central European University or other universities in Hungary. The Government of Hungary has stated publicly that it can only discuss the future of CEU in Hungary with relevant US authorities, which in this case is the State of New York. The Governor welcomes the opportunity to resolve this matter and to initiate discussions with the Hungarian government without delay. Today we held productive negotiations with representatives of the Hungarian government on the status of Central European University . . . We made good progress in talks with Kristóf Altusz, Deputy State Secretary in the Ministry of Foreign Affairs and Trade. On October 3, CEU stated in a press release that “we have been informed that negotiations [between the state of New York and the government of Hungary] have created the basis for an agreement” (source in English). On October 3, 2017, Central European University announced that it had concluded a provisional agreement with Bard College, a private university located about 100 kilometers north of New York City, “to provide educational activities in New York,” thus enabling CEU to comply with the stipulation of the amendments to the Law on National Higher Education requiring foreign universities operating in Hungary to conduct higher education in the country in which they are based (source in English). On October 13, 2017, Justice Minister László Trócsányi announced that the Orbán government would submit a bill to the National Assembly to amend the Law on National Higher Education in order to extend the deadline for foreign universities operating in Hungary to meet the stipulations of the law by one year—from January 1, 2018 to January 1, 2019 (source in Hungarian). An agreement between the State of New York and the Government of Hungary guaranteeing CEU’s existence is ready for signature. Resolution of this matter is now up to the government. The government can simply sign the agreement it has already negotiated. Extending the deadline and failing to sign the agreement are a step backward. CEU wants to move forward. CEU calls on the Government of Hungary to sign the New York-Hungary agreement without delay and re-affirms its commitment to fulfill all obligations, defend its freedom and continue its presence as a respected member of Hungarian and international academic life. On October 17, Fidesz-KDNP National Assembly representatives voted to approve the bill to extend the deadline for compliance with the amended Law on National Higher Education (source in Hungarian).